News from LMCU: Earn While You Spend! Groceries and gas are necessary purchases each month so why not earn while you spend! Use the Max Rewards card and earn 3%* for all gas purchases, 2% back on all groceries and 1% back on everything else. 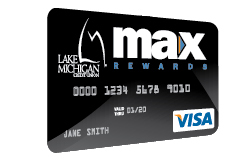 The Max Rewards card has no annual fee, no balance transfer fees, and the ability to redeem points for cash, travel or merchandise. For a limited time, take advantage of 2.99% APR* for 12 months on all purchases and balance transfers when you open an account between now and June 30!**. Plus we’ll give you 1,000 points when you make your first purchase and 5,000 additional points when you reach $500 in purchases! That means $60 in your pocket simply for buying the things you already need! Apply for your Max Rewards Card today. Just call, click or visit any branch. *Cash advances not included. Maximum earned on first $500 spent on gas/mo., 1% after maximum is reached. Excludes existing LMCU balances. **For 12 months from date of account opening.